Use the media center as a central control for all your local media or media from various media servers. The media which you would like to present and enjoy can be easily selected by the Apple remote control, NV Remote App for iPad, iPhone and iPod touch, trackpad, Magic mouse or keyboard. Due to the very easy configuration and the clean look & feel, the media center is the suitable replacement for "Front Row" and other media center. 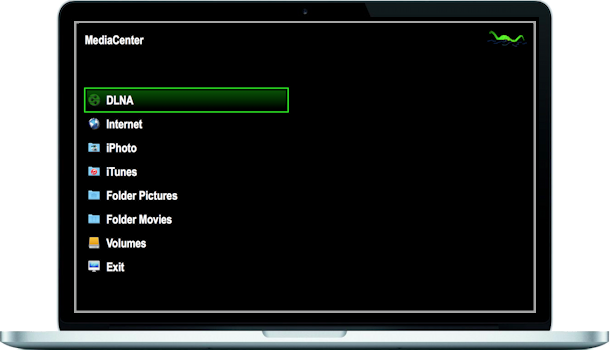 Some content such as DLNA or application media can be (de)activated to display only the major entries in the main menu. The look of the media center can be customized by choosing the background color, selection color, font color and size. Through "Movie Info" a cover/preview and description can be set for DVDs, movies and media shows. Optionally the computer can be shut down or EyeTV activated by selecting "Exit". If EyeTV, iTunes or VLC is the frontmost application, then this application can be remotely controlled by Apple remote control or "NV Remote". Home entertainment as its purest - comfortable and relaxing, from the couch, armchair, bed or directly at the Apple computer! The metadata display for local media prevents analyzes: covers are only searched & displayed for DVDs (and can be deactivated). For movie files, however, only metadata like image preview, movie length and size are displayed - covers & descriptions must be set by "Movie Info". The reason for this is simple: movie files unlike DVDs may be private videos and their file names are nobody's business, but would be communicated to other companies in an automatic metadata search. Apple, Macintosh, Aperture, iPhoto, iTunes are trademarks of Apple Inc., registered in the USA and other countries. The Miro name, logo and icon are trademarks of the Participatory Culture Foundation (PCF). All the other trademarks are property of the respective entitled companies.